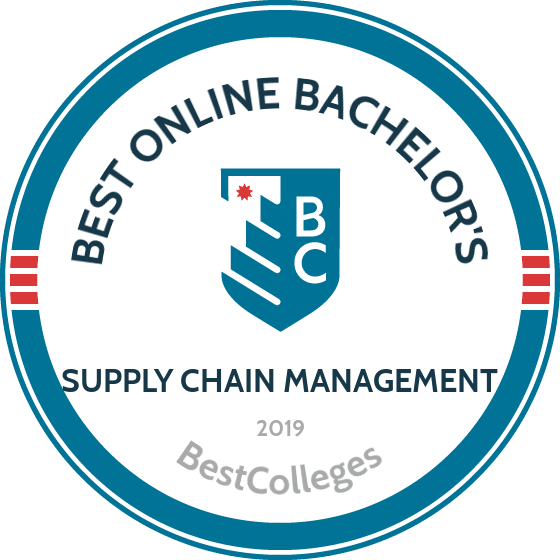 WHAT ARE THE BEST ONLINE BACHELOR'S IN SUPPLY CHAIN MANAGEMENT? What Else Can I Expect From an Online Bachelor's in Supply Chain Management Program? As national and global economies grow in size and complexity, businesses face serious challenges when efficiently coordinating the production and distribution of services and goods while keeping costs low and returns high. An online bachelor's in supply chain management prepares students to effectively tackle these issues by teaching them how to oversee the flow of products and transportation, lead teams, and facilitate communication and funds between companies, suppliers, and customers. The best online supply chain degrees offer foundations in business theory and best practices, which allows students the flexibility to work in a variety of industries or pursue a postbaccalaureate education. Supply chain management is one of the fastest-growing jobs in the U.S. economy. The Bureau of Labor Statistics projects that positions in administrative services management will grow 10% between 2016 and 2026. Yes, by pursuing an online bachelor's in supply chain management you will gain new skills and build upon your previous knowledge. An undergraduate education provides you with a foundational knowledge of the field and offers you the flexibility to pursue advanced or specialized courses that support your interests and career goals. These programs also offer professional opportunities like internships, networking, and job placement assistance. Online bachelor's in supply chain management programs typically do not require extensive work experience to qualify for application; however, experience in the field can boost your chances of getting into a competitive college or university. Work experience may also improve your chances of earning a scholarship if it directly relates to supply chain management. For many schools, students with applicable professional experience can earn college credit for certain skills and expertise. CAN I WORK WHILE I COMPLETE MY ONLINE BACHELOR'S IN SUPPLY CHAIN MANAGEMENT? Most online bachelor's in supply chain management programs cater to working professionals. Online programs often feature asynchronous courses, allowing students to view class lectures and read course materials on their own schedule; however, assignments, projects, and exams typically have deadlines. Students who have jobs in the field may also enjoy other perks, like tuition reimbursement from their employer or the ability to use their job to fulfill internship requirements. Enrolling more than 54,000 students annually, Florida International University is among the 10 largest higher education institutions in the United States. The school delivers nearly 200 academic programs, including remote options, such as the online bachelor of business administration in logistics and supply chain management. This BBA program prepares students to become leaders within the international marketplace and to implement efficient and cost-effective trade systems. The 120-credit curriculum includes major courses, such as logistics technology, export marketing, and decision-making and negotiations. Students also take business core courses, during which they learn how to apply quantitative methods to financial management and operations analysis. The remaining credits comprise upper-division business classes. The flexible curriculum allows learners to pursue topics that support their academic and career goals. Students can begin classes in the fall, spring, or summer. First-time students submit SAT or ACT scores and high school transcripts. Transfer applicants with at least 60 previous credits do not need to submit standardized test scores. Through the Connect4Success initiative, Florida residents who graduate from a participating in-state community college receive guaranteed admission to FIU. The university does not maintain a GPA requirement for applicants. However, students must earn at least a 2.5 GPA in pre-core business classes to officially pursue the online supply chain management degree. Distance learners benefit from affordable, per-credit tuition rates based on residency status. All students can apply for financial aid, including transfer awards and merit scholarships. FIU's business programs hold accreditation from the Association to Advance Collegiate Schools of Business. Brandman University offers 39 remote undergraduate programs, including an online bachelor of business administration in supply chain systems. Students in the degree completion program gain the core business skills needed to plan and manage lean supply networks. Students also learn to identify sourcing partners, develop efficient shipping mechanisms, and manage labor relations. Brandman students can earn their supply chain management degree online through asynchronous coursework. Learners can also pursue the degree in a hybrid format, by combining online learning through the Blackboard platform with on-campus classes in Irvine, California. The 120-credit curriculum comprises general education requirements, core classes, and emphasis courses in supply chain systems. Core business classes teach learners to strengthen organizational behavior and lead multidisciplinary teams. Students take advanced coursework in topics such as strategies across the supply chain, information systems, and project management. Through guided electives, students can pursue complementary topics, such as finance and entrepreneurship. Graduates often secure management positions in freight transportation, data warehousing, manufacturing supply chain, and loss prevention. Applicants to the degree completion program must have at least 12 transferable credits earned with a minimum 2.0 GPA. Candidates who do not meet the transfer requirement can complete the four-course Brandman track program before pursuing their online BBA. The university determines the eligibility of military students on an individual basis. Distance learners pay an affordable, per-credit tuition rate and can qualify for financial support. Brandman offers undergraduate scholarships reserved for business majors and California residents. Based in Greenville, North Carolina, ECU delivers 23 remote degree completion programs, including two supply chain management programs. Learners can pursue an online bachelor of science in business administration (BSBA) with a concentration in operations and supply chain management or an online bachelor of science in industrial distribution and logistics. Both programs teach students to improve an organization's production system and supply chain to compete in the global marketplace. Totaling 120 credits, the BSBA program focuses on fundamental concepts in professional communications and ethical decision-making. Students take six classes in concentration topics, including strategic logistics management, purchasing and materials management, and business and organizational marketing. The curriculum aligns with industry standards and prepares students to sit for the certified purchasing manager exam. The BS in industrial distribution and logistics requires 120 credits in classes such as procurement and inventory control, strategic global sourcing, and industrial psychology. Students complete an internship through a local company or university partner. The program holds accreditation from the Association of Technology, Management, and Applied Engineering. Graduates often pursue careers in fields including e-commerce, wholesale distribution, and international logistics. First-time students pursuing their supply chain degree online must submit high school transcripts and ACT or SAT scores. Transfer applicants over the age of 21 do not need to submit standardized test results. Although ECU does not set a minimum GPA requirement, the admissions committee considers each applicant's GPA. The university offers discounted tuition rates for North Carolina residents, active military personnel, and veterans. The University of Massachusetts Amherst offers online undergraduate and graduate programs, including an online bachelor of business administration in operations and information management. Accredited by the Association to Advance Collegiate Schools of Business, the program prepares students for careers in enterprise resource planning, product design, quality assurance, and distribution and logistics. The 120-credit curriculum includes core classes in business data analytics, management communications, and corporate finance. Students take major coursework in business intelligence, high-performance organizations, and business processes and enterprise systems. Three guided electives allow students to pursue advanced topics in business-related areas, such as finance and sport management. The online supply chain management degree plan includes seven open electives, which learners can use to earn a complementary minor. Most students learn a foreign language to improve their professional effectiveness in the global economy. Graduates often secure positions as departmental managers, retail logistics specialists, and health services consultants. UMass Amherst offers fall and spring enrollment. Applicants must hold at least 27 transferable credits. The university accepts up to 75 transfer credits from regionally accredited institutions. Applicants must submit official transcripts, a resume or CV, and a personal statement. All online students pay the same affordable tuition rates, regardless of residency. The school's Isenberg Scholarship Program awards more than $450,000 in financial aid each year. While all undergraduate students can apply for funding, sophomores and juniors receive priority. Ball State University offers more than 70 affordable online programs, including an online logistics and supply chain management program, available as a BA or BS. Businesses of all sizes and across industries need skilled professionals to coordinate sourcing and delivery. Nearly 100% of program graduates obtain a job in the field or pursue further education. Graduates often work as inventory planners and transportation solutions analysts. Students earning the logistics and supply chain management degree online complete 120 credits. The curriculum includes a 39-credit general education core and 13 foundational business classes. Students then complete major courses in topics including simulation, modeling, and optimization; global logistics and transportation management; and quality management and Lean Six Sigma. The program culminates in an integrative capstone project, during which student groups develop and present viable alternatives to a top company's supply chain transactions. Each student's personal academic adviser helps them plan their course schedule and explore career options. Advisers also help learners complete an industry internship, which provides practical experience matching the student's career interests. BSU offers fall, spring, and summer start dates. Freshman applicants must hold a minimum 2.5 GPA and submit adequate SAT or ACT scores. Transfer applicants must hold at least a 2.0 college GPA. Founded in 1822 as a women's academy, Athens State University now offers coeducational programs in education, business, and the arts and sciences. The university's online offerings include a bachelor of science in logistics and supply chain management, which emphasizes business information systems. Students learn to apply data-driven resources to develop efficient and responsive supply chain networks. The 124-credit curriculum includes general education requirements, prerequisites, and major coursework. Students personalize their training through open electives in advanced business topics. Required classes include organizational communication, logistics and distribution, and acquisition and contract management. Students develop the skills necessary to procure raw materials and move finished products across trade borders. Like many supply chain management online degree programs, Athens State's program requires a business policy capstone course. Students also take a senior seminar, during which they organize and present portfolios related to their post-graduation plans. Students also take a cumulative exam to demonstrate competency in core concepts and skills. For regular admission, applicants must have 60 transferable credits or an associate degree from an accredited school. Applicants must also hold a minimum 2.0 GPA. The university offers joint enrollment for current community college students. All distance learners pay the same affordable tuition rates, regardless of residency. Athens State provides more than $1 million in financial aid each year, including merit- and need-based scholarships. California Baptist University delivers 44 remote undergraduate and graduate programs, including an online bachelor of arts in business administration with a concentration in logistics and operations. The comprehensive program covers the entire product life cycle; students learn to allocate materials, design cost-effective production systems, coordinate delivery, and solve problems related to international transport regulations. The program holds accreditation from the Accreditation Council for Business Schools and Programs, which qualifies graduates to pursue all major industry certificates and licenses. The 120-unit curriculum includes 43 general education units, along with core business requirements and concentration classes. Required classes include quantitative business analysis, organizational management, and applied marketing principles. Students also learn to control production and manage inventory with respect to the global supply chain. The program culminates in a project and team management seminar that focuses on the technological aspects of leading teams through the project cycle. Learners work in groups to identify relevant techniques and tackle challenges in logistics and operations. CBU offers courses year round, and students can earn their online supply chain management degree entirely through asynchronous classes. Online learners can also attend some classes at CBU's campus in Riverside, California. CBU accepts recent high school graduates with a minimum 2.0 GPA but prefers applicants with at least 24 transferable units. Students with sufficient transfer units can complete the program within 16 months. All distance learners pay the same affordable, per-credit tuition rate. Located in Manchester, Southern New Hampshire University offers more than 200 academic programs, including an online bachelor of science in operations management with a concentration in logistics and transportation. Students in the program explore complex and interconnected supply chain processes. Learners develop the communication and analytical skills necessary to incorporate suppliers, manufacturers, storage facilities, and distributors into an efficient operational network. The 120-credit program includes coursework in continuous improvement tools and techniques, sustainable operations, and reverse logistics. Students learn how to use spreadsheets to aggregate and interpret data that informs business decisions. Students also complete advanced coursework in the logistics and transportation concentration. The curriculum includes five free electives, which learners can use to complete an internship, take additional business courses, or pursue a complementary minor. Students earning the supply chain degree online complete their training with a capstone experience, during which they apply core program competencies in simulated work scenarios. Graduates often pursue positions as logistics team leads, inventory control managers, and supply chain analysts. SNHU does not require applicants to have a minimum GPA or to submit standardized test scores. The university's generous transfer policy allows students to apply up to 90 previous credits toward the degree. All distance learners pay the same affordable tuition rates, and SNHU accepts applications on a rolling basis. The university delivers online courses through Blackboard in an eight-week, asynchronous format. Established in 1966, Bellevue University provides accessible and career-specific academic programs. The school offers more than 40 remote business programs, including an online bachelor of science in supply chain, transportation, and logistics management. The program covers various aspects of the distribution and interchanging of products and services. Because the curriculum aligns with established educational standards, graduates qualify to pursue certifications from the Association for Supply Chain Management. The 127-credit program includes classes such as decision-making in a global environment, business logistics systems analysis, and managing the international organization. Students also explore finances and learn how the supply chain affects a firm's cash and capital, with a focus on transportation modes. The curriculum includes 51 elective credits, which students can use to take additional major coursework or to complete a minor in a complementary field, such as accounting, organizational communication, or psychology. The program culminates in a capstone experience, which requires students to apply classroom skills and knowledge to create a professional report. Graduates often become purchasing agents, operations research analysts, and material moving specialists. Unlike other online supply chain management degrees, BU's program follows a cohort format, meaning students progress through the curriculum with a group of peers, in a virtual classroom that emphasizes collaboration. Applicants must have an associate degree or 60 transferable credits earned with a grade of C- or better. All online students pay the same per-credit tuition rate. Based in Albany, New York, Excelsior College enrolls more than 36,500 students. The school offers undergraduate and graduate degrees, including an online bachelor of science in business with a concentration in logistics management. The program trains students in business fundamentals and strategic concepts needed to manage global supply chains. In addition to required coursework in the arts and sciences, the 120-credit curriculum includes 10 business core classes. Students explore managerial accounting, international business, and marketing principles. The curriculum also includes five courses in the logistics management concentration. Students learn to synthesize multidimensional business methods to control inventory, manage warehousing costs, and solve challenges related to international trade and distribution. Students complete a strategic management capstone project, which involves a simulation experience during which students apply core competencies to analyze the factors influencing strategic business decisions. Students present results and recommendations to industry experts and faculty. Excelsior delivers online classes through Blackboard, in eight- and 16-week asynchronous formats. Excelsior evaluates applications holistically and does not require standardized test scores or a minimum GPA. The university maintains a generous transfer policy and accepts transfer credits earned within the past 15 years with at least a C- average. All online learners pay the same affordable, per-credit tuition rate, regardless of residency, and active military members and veterans receive a tuition discount. Excelsior offers financial aid opportunities, including need-based awards and scholarships specifically for students pursuing the online supply chain management degree. Embry-Riddle Aeronautical University offers 45 online programs, including an online bachelor of science in logistics and supply chain management. Students gain a broad skill set and prepare for positions in diverse local and global industries. Graduates often pursue roles with manufacturers, supplying raw materials to produce food, furniture, and aircrafts. Others work with distributors, ensuring goods and services arrive on time and under budget. Students earning the supply chain management bachelor's degree online complete asynchronous classes through Canvas. Students can also pursue the degree in a hybrid format by taking some classes in person at either of ERAU's two main campuses or any of its 135 worldwide learning centers. The university's flexible transfer policy allows students to earn credits for prior learning, professional certificates and licenses, and military training and service. The 120-credit program requires coursework in purchasing principles, transportation science, and management of production and logistics. Students also examine the physical transportation of goods through multiple channels of distribution. Learners prepare to tackle challenges related to air cargo and aviation, including inventory management, capacity planning, and distribution center coordination. The curriculum includes 12 business electives and 18 open electives, and the program culminates in a strategic management comprehensive exam. Graduates qualify to sit for certification exams from the Institute for Supply Management. The university strongly recommends that freshman applicants submit ACT or SAT scores. Transfer applicants need a minimum 2.0 GPA. All distance learners pay the same affordable tuition rate, with discounts available for military students. Founded in 1899, Azusa Pacific University enrolls approximately 10,000 students annually. The school offers more than 100 certificates and degrees, including an online bachelor of business administration with a major in logistics and supply chain management. The program emphasizes practical applications and prepares students to develop lean supply networks that effectively respond to rapidly changing global economics. The 120-unit curriculum includes core classes in financial accounting, spreadsheets and information technology, and marketing principles. Students also explore business law and organizational behavior. Advanced major classes teach students how to procure materials and deliver goods while minimizing warehouse stock and transportation costs. The online supply chain management degree also covers cross-cultural team leadership and global trade regulations. Students can earn the degree entirely online and take classes asynchronously, through Blackboard. Students can also choose a hybrid format, which involves taking accelerated courses at one of the university's four campuses in Southern California. Students can complete an optional internship in their community and can attend university-sponsored international trips. Applicants to APU's degree completion program must have at least 15 transferable units and a minimum 2.5 GPA. Applicants must submit official transcripts and a personal statement detailing their career goals. APU offers affordable, per-credit tuition rates, and its online business programs hold accreditation from the International Assembly for Collegiate Business Education. Chartered in 1963 as a commuter campus, Kennesaw State University now houses more than 5,000 resident students in eight residential communities across two metro Atlanta campuses. KSU enrolls more than 35,000 undergraduate and graduate students and ranks as Georgia’s third largest university. Students from all 50 states and 92 countries choose from over 150 baccalaureate, graduate, and doctoral degrees in diverse disciplines. KSU holds regional accreditation from the Southern Association of Colleges and Schools. The university offers an online supply chain management degree that leads to a bachelor of applied science in supply chain logistics (BASSCL). KSU designed the program specifically for students with an associate of applied science or associate of applied technology degree. Students must have earned their associate degree from a Technical College System of Georgia school or a regionally accredited institution. The university's BASSCL program comprises 120 credits, including 60 general education and lower division major requirements. The remaining 60 credits consist of 51 major credits and nine credits of upper-level electives. All BASSCL major courses follow an online, synchronous delivery format that includes a live component once a week that both on-campus and online students attend. Students can access prerecorded lectures and other course materials online at any time. Minnesota State University Moorhead began in 1888 as the Moorhead Normal School, with five faculty members and an enrollment of 29 students. At the time, the school did not charge tuition if students committed to teaching for two years in Minnesota after graduation. MSU Moorhead now enrolls nearly 6,000 undergraduate and graduate students and offers 82 majors, 11 preprofessional programs, and 15 graduate degrees, in addition to several undergraduate and graduate certificates and teacher licensure preparation programs. MSU Moorhead offers a supply chain management degree online that helps students develop the skills to manage local, national, and global distribution of goods and services. Students enroll in 39 credits of core major requirements that include classes in operations management, methods of improvement, purchasing and sourcing management, logistics management and network design, and management information systems. Supply chain management students also must complete two related course requirements: microeconomics, and probability and statistics. The university maintains a generous transfer credit policy. Applicants with an associate of arts or associate of science degree from a regionally accredited institution can typically transfer most of their credits towards the bachelor of science in global supply chain management degree. MSU Moorhead maintains articulation agreements with several community and technical schools, including Northland Community and Technical College and Anoka Ramsey Community College. The university holds accreditation from the Higher Learning Commission. Originally named Park College and founded in 1875, Park University maintains a partnership with the U.S. military, providing educational opportunities for service personnel and their families since 1889. In 2000, Park College officially became Park University. Today, the university boasts a student population of more than 16,000 students from all 50 states and 89 countries. It offers more than 48 baccalaureate degrees, eight master's programs, and several undergraduate degrees and graduate certificates. Park holds accreditation from the Higher Learning Commission. The university's School of Business offers a bachelor of science degree in management/logistics that students can pursue online, on campus, or through a hybrid delivery format. Students examine the principles and practice of logistics and supply management, learn to improve overall efficiency, and manage the impact of logistics and supply chain operations on overall profitability. The School of Business holds accreditation from the Accreditation Council for Business Schools and Programs. The BS in management/logistics degree comprises 120 credit hours, 66 of which involve degree-specific core coursework and approved electives. Students focus on the principles of financial and managerial accounting, microeconomics and macroeconomics, business law, applied computer technology for business, and advanced business statistics. The BS in management/logistics curriculum prepares students for professional certification administered by the American Production and Inventory Control Society. Southern Wesleyan University began in 1906 as the Wesleyan Methodist Bible Institute. The school was chartered as Wesleyan Methodist College just three years later, and officially became SWU in 1994. The university is accredited by the Southern Association of Colleges and Schools. SWU's Benson School of Business holds candidacy status with the Accreditation Council for Business Schools and Programs. SWU offers an online supply chain management degree that does not require any campus visits. Students completing the program earn a bachelor of science degree in business administration with a concentration in supply chain management. Coursework follows a seven-week delivery schedule. Although most of the online courses at Wesleyan use a asynchronous format, professors sometimes schedule specific times for online meetings. Online programs at SWU begin in May, August, and January. The supply chain management program comprises 120 credits, typically broken down as follows: 40-44 credits of core curriculum requirements, 45 credits of major requirements, 12 credits of concentration coursework, and 19-23 credits of approved electives. SWU's Benson School of Business requires all BSBA students in the supply chain management concentration take courses in project management, logistics, and strategic sourcing and procurement management. Founded as Mississippi Normal College in 1910, the University of Southern Mississippi underwent two name changes (State Teachers College in 1924 and Mississippi Southern College in 1949) before achieving university status in 1962. Today, USM enrolls 15,000 students and offers more than 190 undergraduate and 240 graduate degree plans on two campuses, at several teaching and research sites, and online. The university holds accreditation from the Southern Association of Colleges and Schools. USM offers a logistics and supply chain management degree online through its School of Construction and Design. The program holds accreditation from the Engineering Technology Accreditation Commission of the Accreditation Board for Engineering Technology. Students who complete the program graduate with a bachelor of science degree in industrial engineering technology logistics. Students enroll in 45 credit hours of major coursework that include classes in industrial automation, logistics distribution systems, industrial simulation and modeling, and motion and time study. Students must complete a capstone project prior to graduation. USM maintains a generous transfer policy, allowing students to transfer up to 62 credit hours earned at an accredited community college or four-year institution into the degree. USM charges online students the same tuition rate, regardless of residency, and online students can apply to the same scholarships as their on-campus peers. Founded as Arizona Normal College in 1899, Northern Arizona University initially enrolled only 23 students, taught by two teachers. The school achieved university status in 1966. Today, NAU boasts a population of more than 31,000 students and offers 95 baccalaureate degrees, 76 postbaccalaureate degrees, and several undergraduate and graduate certificate programs. NAU holds accreditation from the Higher Learning Commission. Northern Arizona University offers a logistics and supply chain management degree online that leads to a bachelor of applied science (BAS) degree. NAU designed the BAS program specifically for students who have completed, or are in the process of completing, an associate degree from a community college. Students transfer in at least 64 credit hours from an accredited associate program. Students who have completed an associate of applied science degree from an Arizona community college can transfer up to 75 credit hours towards the BAS degree. Core logistics and supply chain management coursework includes the principles of management in a global economy, green logistics and supply chain management, economic analysis and business law, supply chain and operational management, and strategic logistics and supply chain management. The degree completion program requires students to complete a capstone project prior to graduation. Founded in 1827, Lindenwood University began as the Lindenwood School for Girls. Students followed a curriculum that included classes in literature, grammar, diction, music, and painting. Having achieved university status in 1997, Lindenwood now offers over 115 undergraduate and graduate programs and enrolls more than 6,000 students from all 50 states and 70 countries. Lindenwood holds accreditation from the Higher Learning Commission and ranks among the best online bachelor's programs, according to U.S. News & World Report. The Robert W. Plaster School of Business & Entrepreneurship at Lindenwood offers an undergraduate business administration program with an emphasis in supply chain management. Students can pursue a BA or BS degree. Both programs include 51-57 credit hours of core business and general education courses. The BA program requires 75-77 credit hours in the major, while the BS degree requires 82-84. Lindenwood offers all coursework for either program entirely online. The supply chain management emphasis consists of the following four courses: principles of supply chain management, principles of procurement management, principles of logistics management, and international marketing. Lindenwood's business school holds accreditation from the Accreditation Council for Business Schools and Programs. Lindenwood offers many of its online courses in an accelerated format and delivers most coursework asynchronously. Northern Kentucky University started out in 1948 as an extension campus for the University of Kentucky. In 1968, the school became an independent institution, taking the name Northern Kentucky State College. The college achieved university status in 1976 and debuted its current name, Northern Kentucky University. The university supports a current student population of 14,500 and offers more than 70 undergraduate majors and 22 master's programs. The Southern Association of Colleges and Schools has accredited the university since 1973. NKU offers an online bachelor's degree in business administration (BSBA) with a concentration in global supply chain management. The degree comprises 120 credit hours, distributed as follows: 37 general education credit hours, 50 business core credit hours, nine credit hours of major electives, and 12 credit hours each of core courses and free electives. Online courses at NKU follow a seven-week delivery schedule and the university offers several start dates throughout the year. Students pursuing the supply chain management concentration take courses in global strategic sourcing, logistics and distribution, supply chain management, and global supply chain analytics. Transfer students must complete 12 credit hours at the university before applying to the BSBA major. NKU charges nonresident online students the same tuition rate as resident students. When St. Paul-based Metropolitan State University opened in 1971, it functioned as an upper-division institution for working students, offering bachelor's degrees taught by a practice-oriented faculty. In 1983, the university enrolled its first graduate students and in 1994 it welcomed freshmen students for the first time. Metropolitan State continues to attract working students (the average student age is 31), although 90% of its students are enrolled in undergraduate programs. Metropolitan State holds accreditation from the Higher Learning Commission. Metropolitan State offers a supply chain management degree online through its College of Management. The college holds candidate status with the Accreditation Council for Business Schools and Programs. Prior to declaring their major, students must complete 22 credits of foundation courses in statistics, college algebra, microeconomics, macroeconomics, financial accounting, and information technology fundamentals. Once accepted to the major, students enroll in 32 credit hours of core business and supply chain management courses. Students who complete the program earn a bachelor of science degree in supply chain and operations management. The university's Center for Online Learning provides online students with a variety of services and resources, including academic advising, tutorial videos, and course schedules. The online supply chain management degree accepts students participating in the university's Transfer Pathways program. Students who complete an associate program from a Minnesota state college can transfer all 60 credits of the associate program towards the BS in supply chain and operations management degree. Portland State University began as the Vanport Extension Center in 1946, offering the first two years of college-level education to an enrollment of 220 students. Many students were soldiers returning from World War II taking advantage of the educational opportunities contained in the GI Bill. When the Oregon State Legislature granted the school four-year college status in 1955, the Vanport Extension Center became Portland State College. Fourteen years later, the school achieved university status and became PSU. The university currently offers 226 degrees and enrolls 29,000 undergraduate and graduate students from all over the U.S. and 91 countries. PSU holds accreditation from the Northwest Commission on Colleges and Universities. The university offers a completely online supply chain management degree through its School of Business, which holds accreditation from the Association to Advance Collegiate Schools of Business. The program also holds certification from the Institute for Supply Management. As a degree completion program, the degree covers junior and senior level requirements for a bachelor's degree in supply and logistics management. Students enroll in classes that build their expertise in four key supply management areas: logistics, manufacturing, planning, and sourcing. The program consists of 24 credit hours of business core and supply and logistics coursework. PSU offers its online enrollees the same services as on-campus students, including academic advising, career services, and online tutoring. Online students can apply for the same scholarship opportunities available to on-campus students. Founded in 1889 by the Order of Saint Benedict, Saint Leo University is the oldest Catholic institution in the Sunshine State and one of the 10 largest Catholic universities nationwide. The university supports a diverse population of over 13,000 students from more than 90 countries and all 50 U.S. states. Saint Leo offers more than 50 undergraduate degrees in addition to several master's, doctoral, and certificate programs. The university holds accreditation from the Southern Association of Colleges and Schools. U.S. News & World Report includes Saint Leo in its 2019 rankings of the best regional universities in the South and best value schools in the South. Saint Leo offers a bachelor of arts in business administration degree with a specialization in logistics through the Donald R. Tapia College of Business, which holds accreditation from the Accreditation Council for Business Schools and Programs. Students accepted to the business administration program complete 120 credits comprising 42 credits of university exploration (general education) courses, 36 credits of core business courses, 24 credits in logistics, and 18 credits of general electives. Students pursuing the logistics specialization focus on logistics processes commonly used in both civilian and military organizations. They enroll in classes in transportation and distribution management; logistical inventory control and inventory management; procurement, purchasing, and vendor management; and quality improvement and management. The program culminates with a required capstone project. The program focuses on the study of logistics processes in both products and services. Topics covered include cargo transportation in all modes, electronic order processing, distribution, purchasing, warehousing, quality management and improvement, and the estimation of production and ordering quantities. Founded in 1965 as Florida Junior College, Florida State College at Jacksonville enrolled 2,600 students during its first year. A little more than two decades later, the school changed its name to Florida Community College at Jacksonville to reflect its growth. It took on its current name in 2009, and now offers more than 100 workforce certifications and technical certificates, 45 associate degrees, and 13 bachelor's degrees. FSCJ holds accreditation from the Southern Association of Colleges and Schools. FSCJ offers a logistics and supply chain management degree online that prepares students for careers as operations managers, logistics coordinators, and distribution and transportation managers. Applicants must either hold an associate of science or associate of arts degree or have completed at least 60 transferable credits from a regionally accredited college or university. Students graduate from the program with a bachelor of applied science (BAS) degree. As FSCJ's BAS program covers upper division coursework and electives only, most students earn the degree after five semesters of full-time enrollment. Students must meet a foreign language requirement by completing eight semester hours studying one foreign language or American Sign Language. Most online courses use an asynchronous delivery format, although they follow the same schedule as on-campus classes. Online students meet the same deadlines for course requirements and sit for the same exams as onsite enrollees. In 1902, classes taught at the Columbus, Ohio YMCA officially came under the newly established YMCA School of Commerce, the forerunner of Franklin University. More than three decades later, the school adopted its current name, before officially becoming a separate entity in 1964. Since its founding, Franklin has focused on working students, with many learners over the age of 30 pursuing one of the university's 30 bachelor's degrees and five master's degrees. Franklin holds accreditation from the Higher Learning Commission. Franklin offers an operations & supply chain management degree online, as well as an online logistics management degree. The operations and supply chain management program holds accreditation from the International Assembly for Collegiate Business Education and consists of 126 semester hours. Students must complete a capstone project to complete either degree. Both programs lead to a bachelor of science degree. The university designed the logistics management degree primarily as a degree completion program. It follows the university's generous transfer credit policy, allowing students to transfer up to 94 credits earned at an accredited college or university. The logistics management degree comprises 124 semester hours. Online courses at Franklin use an asynchronous mode of delivery. Distance learners can access their coursework, the library, the bookstore, and student services at any time. The university follows a trimester schedule and provides online students with several start dates within each trimester. Supply chain management professionals handle the procurement, warehousing, and transportation of goods in a complex and fast-paced economy that demands quick thinking and creative solutions to logistical challenges. Below, we list what you can expect from a degree in supply chain management online. However, this information may change based on the program you choose. It's always best to consult with a school's academic advisor before applying. Sample coursework can be found below. It reflects the topics found in this kind of degree. Specific academic requirements vary from program to program. Supply Chain Fundamentals: This required class introduces core concepts, methodologies, and processes in supply chain management. Students explore logistics cost analysis and values of logistics performance. They also delve into the strategic use of information technology for improving efficiency and recruiting clients. Additional topics include the challenges of using third-party providers and the trade-offs among transportation, warehousing, and inventory activities. Transport Systems: In this fundamental course, students develop an understanding of the strategic role freight transport services and systems play in the supply chain. The class emphasizes systems components, like operational processes, cost conditions, and technological features. Through problem-based learning, students learn about the buyer-seller methods for acquiring freight transportation and tactical delivery alternatives. Demand Fulfillment: This class teaches students how to manage customer demands, including fulfilling orders in business-to-consumer and business-to-business markets. Degree candidates learn about the flow of goods and funds from the moment they receive an order to the full satisfaction of the order's requirements. Additional topics include distribution operations, inventory control, productivity analysis, and strategic demand management. Sourcing and Procurement: Students learn core purchasing techniques, concepts, and tools. They learn about the ways effective purchasing improves an organization's competitive performance and success. Through analyzing case studies, learners develop an understanding of the demands placed on supply chain managers to facilitate a continuous flow of goods while minimizing inventory and maintaining quality standards. International Logistics: In this advanced class, students examine the national government's role in global logistics. They delve into ocean and air transportation to Mexico, Canada, and European countries and study components like documentation, insurance, intermediaries, importing, and exporting. Additional topics comprise globalization trends as they relate to business and international supply chains. How Long Does It Take to Get an Online Bachelor's in Supply Chain Management? Undergraduate students complete roughly 120 credits to obtain a logistics and supply chain management degree online. For conventional programs, this process takes four years; however, distance learners may graduate sooner by enrolling in accelerated or degree completion tracks. Students can earn their credentials in as few as two years. These intensive, full-time programs typically require applicants to possess relevant career experience or completed prerequisite coursework. Working professionals who prefer a slower pace that accommodates busy work and family schedules can opt for part-time degree plans, earning their bachelor's in 5-7 years. Program structure also affects a program's timeline. Most online bachelor's programs feature an individually paced learning style that allows students to take as few, or as many, courses as they want, within reason. Other colleges and universities require distance learners to engage in cohort learning, which emphasizes peer collaboration. In cohort formats, students take one or two classes at a time and progress through the curriculum at the same rate as their peers. To earn a respected supply chain management degree, online students must attend nationally or regionally accredited schools. Colleges and universities obtain national accreditation from the Department of Education (ED) and the Council for Higher Education Accreditation (CHEA). Schools can apply for regional accreditation from one of seven organizations, depending on location. For example, California schools become regionally accredited through the Accrediting Commission for Schools Western Association of Schools and Colleges. In addition to national and regional stamps of approval, online supply chain management programs may pursue specialized accreditation. The Accreditation Council for Business Schools and Programs (ACBSP) and the Association to Advance Collegiate Schools of Business (AACSB) serve as the main accrediting organizations in this field. Generally, ACBSP-accredited programs emphasize educational outreach and teaching, while schools with the support of AACSB focus on research and publication. In either case, students can rest assured that the training they receive match what employers expect of qualified candidates. Professionals who possess an accredited degree also guarantee that they can sit for all major certification and licensure exams. The ED was founded in 1980 under President Jimmy Carter and represents a cabinet-level agency of the federal government. Due to the decentralized nature of the U.S. education system, the ED does not create schools. However, without the department's support, colleges and universities cannot access government funding, including student grants, loans, and work-study money. Established in 1996, CHEA is a nongovernmental and nonprofit organization that seeks to generate and maintain independent academic standards. The council provides member schools with financial, networking, and developmental resources. CHEA also supports 60 partner organizations that deliver specialized and regional accreditation. For more information on academic accreditation, students should visit the ED website and CHEA website. Aggregating data from Payscale, the following table displays average salaries for five supply chain management careers across a professional's lifetime. Students should note that pay potential differs greatly based on industry, employer, and a candidate's qualifications. Location also affects salary. For example, the Center for Education and the Workforce reports that business majors earn approximately $70,000 in California, $67,000 in New York and Illinois, $65,000 in Texas, and $54,000 in Florida. Procurement analysts enjoy the highest entry-level pay at $56,504. Surprisingly, sales managers receive the lowest starting salary of $46,000. Perhaps this discrepancy is due to the large skill gap sales managers must navigate when starting out, since, as the late-career column shows, managers eventually earn the highest salary of the five careers below. By obtaining an undergraduate supply chain management degree, online students prepare for entry-level positions as sales representatives, financial analysts, cost estimators, and transportation coordinators. Most supply chain professionals work for businesses and wholesalers. However, by building career experience, practitioners may occupy roles as advisers and freelance consultants. Management positions also require professionals to build up their resume and earn a master's degree. Graduate credentials prove especially important for students who want to work in international logistics due to the complex nature of foreign transactions and transportation. These business leaders oversee an organization's sales objectives and implement strategies to strengthen revenue. Sales managers select and train employees, assign territories, and set quotas. They also work with financial analysts to evaluate sales data and determine the profitability of services and products. As an advanced position, candidates should possess a master's degree and roughly five years of relevant work experience. As the name suggests, these professionals work for wholesalers and manufacturers to sell goods to government agencies and private companies. Sales representatives identify prospective clients, contact existing buyers, and negotiate prices and delivery. They may specialize in inside sales, working at an office to conduct cold calls and answer incoming messages. Representatives can also occupy outside sales positions, traveling to job sites and visiting clients to conduct negotiations. These professionals aggregate and evaluate data to estimate the materials, labor, and time it takes to create a product or deliver a service. Cost estimators usually specialize in a particular industry, such as manufacturing, retail, or construction. They work in teams, collaborating with architects, engineers, contractors, and financial analysts, to prepare project bids and estimates. In addition to obtaining a degree in the field, students interested in a supply chain management career should consider membership in one or more professional organizations. Students will gain access to the organization's literature and professional training, such as certificates granted by APICS and ISM, and its social and networking events, which include small meetings and large annual conferences. APICS supports supply chain management professionals through career resources, student scholarships, and mentorship opportunities. The society facilitates training workshops and three certification programs, including credentials for production and inventory management. APICS also sponsors the Association for Supply Chain Management. Founded in 1963, CSCMP advances the supply chain management field through research initiatives and professional development programs. Members benefit from online courses, onsite workshops, and three levels of SCPro™ certification. They also enjoy job guidance and postings through the council's career center. Established in 1915, ISM boasts more than 50,000 members in 100 countries. Membership comes with access to industry tools and templates to support daily job duties. Members may take advantage of online instructor-led and self-paced classes through the eISM platform. The institute also delivers comprehensive career services and two certification programs. Students should complete the Free Application for Federal Student Aid (FAFSA) to learn about grants, loans, and other government funding. By completing the FAFSA, you gain access to federal and state scholarships and grants based on need, merit, or academic interests. Students pursuing a degree in supply chain management online should also look into institutional and private awards from professional organizations and businesses. Financial aid for online learning is equivalent to what you will find for campus-based learning, but that hasn't always been the case. Learn about the changes to financial aid and the different funding opportunities available to online students. Online college programs deliver flexible and affordable options to single parents interested in earning a degree and securing their family's financial future. Our list features scholarships, grants, and other financial aid options geared toward single moms and dads. Learn more about grants, scholarships, and other financial aid opportunities available to veterans, active-duty service members, and reservists.